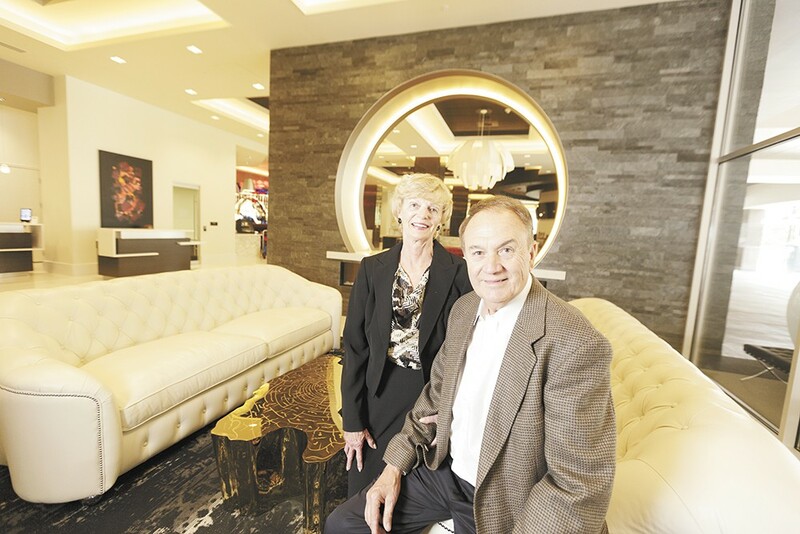 Karen and Walt Worthy inside their new Davenport Grand Hotel. It didn't take long for the people of the Inland Northwest to notice the Davenport Grand Hotel. Upon its completion in June of last year, the imposing and modern white structure made a dramatic change to the Spokane skyline. Located directly south of the Spokane Convention Center, the hotel, the latest development endeavor by Spokane magnates Walt and Karen Worthy, was built to give that venue a true home-base hotel, says Matt Jansen, the longtime corporate director of sales and marketing for Davenport Hotels. The Grand, which features 716 guest rooms and was built for a reported $135 million, hopes to capitalize on the increasing number of large-scale events coming to the convention center. While hotels typically aren't the sort of businesses that locals become all that familiar with, the Grand was able to attract a Spokane following of people who tend to be taken aback by the hotel's interior design. Others got a longer-than-expected look at the Grand when last November's devastating wind storm packed the hotel with Spokanites whose homes were without power. "The reaction is so consistent when people enter the lobby. They tell us that they don't feel like they're in Spokane, but rather a much bigger city. It definitely has that feel," Jensen told the Inlander in the months following the hotel's opening. Our Inlander readers tend to agree with Jensen's assessment. "Spokane loves new things. The Grand Hotel deserves that love. It has a big-city feel. The skywalk and view of the park make it a step above the rest," says Kevin James of Spokane. Located within the Grand, you'll also find two restaurants. There's the Grand Restaurant and Lounge, an openly designed space in the lobby that serves breakfast, lunch and dinner. The most popular dining attraction at the hotel has been Table 13, a small-plates eatery with an interior that's decidedly different from the rest of the hotel and is the brainchild of longtime Spokane chef Ian Wingate. During the warmer months, the Grand Terrace Bar offers open-air dining and cocktail service that pairs well with a view of the Spokane skyline. "The Grand Hotel is unlike anything Spokane has to offer. It is exquisitely modern, and I feel it has a perfect balance of glitz and classic elegance. The staff is friendly and go above and beyond to make the experience amazing," says Adrienne Fischer of Spokane.